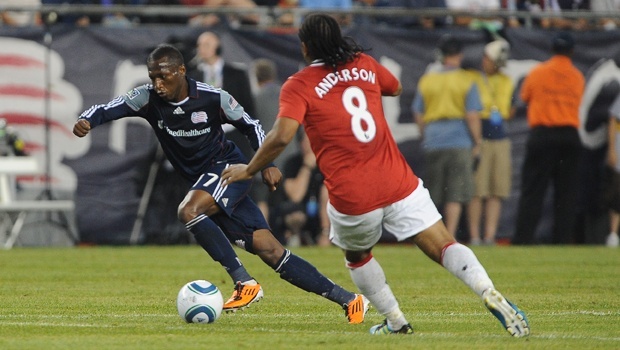 The New England Revolution were set to take on Manchester United in what might have been one of the biggest mismatches ever between an MLS side and a foreign soccer power. Manchester United came in to start their preseason tour and the Revolution were looking to regroup after a trying first half of the season. The Revolution have been in a steady decline in MLS for years. Gone are the powerhouse days of the last decade where Clint Dempsey, Steve Ralston and Taylor Twellman made the Revolution a feared team. Now the Revolution are languishing in last place in the Eastern Conference and are the victims of poor financial support by their owners. Still, they looked at their schedule and found the Red Devils on slate and realized they had the opportunity to turn their doubters to believers. Rain peppered the field in the hours leading up to the match, but the game was played in front of 51,523 fans who were excited to watch their team take on Manchester United. Perhaps that is generous, there were quite a few red jerseys in the stands, but the bottom line is there were there to see a good soccer match. The Revolution were surprisingly spry in the opening minutes as the game went back and forth. 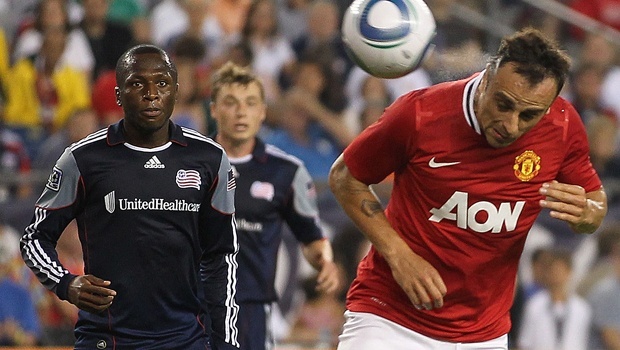 It was obvious from the get go that the Revs had decided that, while defense was on their minds, they would do their best to pressure Manchester United. Roughly 25 minutes in though, Benny Feilhaber, who continues to improve after his injury recovery, found himself attacking the Man U goal. While the play was devoid of any consequence, it was noted that four Red Devils moved to shut him down and there was no one in a New England jersey to support. Tactical decisions were interesting. Entering halftime, the two teams were tied 0-0. Credit where it’s due, the Revolution had a gameplan and they stuck to it… in the first half. Once the second half started though, it was a different story. Several key players were moved around, the goals started coming. By the 65th minute, the score was 3-1 United. United went up 2-0 on goals by Michael Owen and Federico Macheda. New England brought a goal back on a free kick deflection. Benny Feilhaber struck a driven ball into the wall and Kenny Mansally deflected it past the United goalkeeper. Goals kept coming though and ultimately the Revolution fell 4-1 on the night. The later portions of the match became the expected clinic in attack by the Revs and New England was reduced to half chances from distance. Federico Macheda scored another and the final goal was finished off by Ji-Sung Park. Manchester United will be pleased with their performance as they kicked off their preseason tour of America that includes a showdown with the MLS All-Stars, whom the decimated 5-1 last year. Fans can also be encouraged by the play of Feilhaber as the young American looked spry and aware. One player who did not disappoint was Shalrie Joseph, who was his usual consistent self. All in all though, it was a successful night for the Revolution, not so much in the score line, which doesn’t matter. However the success was in bringing more fans out to their stadium and in giving their team the experience of playing a club of Man U’s stature. The Revolution did show well and had moments of quality soccer.